The Corporation that Changed the World is a popular history of one of the world’s most famous companies. Founded in 1600, the East India Company was the forerunner of the modern multinational. Starting life as a trader in Asian Spices, the Company ended its days running Britain’s Indian empire. In the process, it shocked its contemporaries with the scale of its violence, corruption and speculation. This is the first-ever book to expose the truth about the Company’s social record. Robins reveals a hidden story of tragedy and intrigue. War, famine, stock-market bubbles and even duels between rival executives are all to be found in this new account. For Robins, the Company’s legacy provides compelling lessons on how to ensure the accountability of today’s global business. The title may seem like hyperbole, but when you consider the impact that the Company Bahadur (which was the honorific bestowed on the company by the natives of the land it ruled - that would be us Indians) had on much of the world, including India and China, mostly for the worse, and mostly with tragic consequences, hyperbole does not seem like an exaggeration. This book documents the social impact of the Company's rule in India. 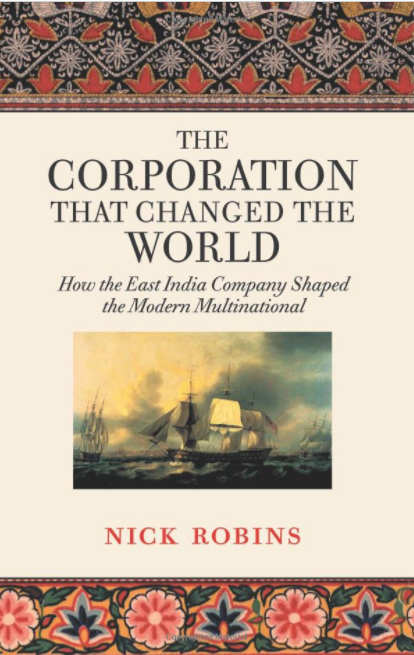 I as an Indians am not particularly inclined to be neutral towards the company, so to some this book comes as a validation of all that was worst about the company, its brutality, venality, avarice, machinations, and all. Sure, one can possibly find some good that the Company, and then the British rule, did for India, but when weighed against the costs that it extracted from India, the balance is certainly not in favor of the Company. Disconnect and denial abounds in some quarters of the British aristocracy. The chief executive of the Standard Chartered Bank remarked that the challenge is now (in 2002) to "build upon the courageous, creative, and truly international legacy of the East India Company." [page 14]. "Rod Eddington, one time chief executive of British Airways" in a similar vein saw it "as a case study in how corporations succeed 'by dint of hard work, shrewdness and charm.' " [page 14, 15]. Yes, charm indeed. The charm of the likes of Robert Clive, a petty thief, who found himself dealing with another thief, Mir Jafar, and managed to come out ahead. What contributed in no small part of the venality and the machinations of the Company employees in India was the fact that "... the Company's overseas staff received a minimal salary and the right to conduct private trade on their own account within Asia." [page 33]. At the time, "there is compelling evidence that India's weavers had 'highher earnings than their British counterparts and lived lives of greater financial security.'" [page 77]. When one reads about the abject poverty that Indian artisans live and die in today, one can only weep. Here I would like to add that people should make it a point to read P Sainath's excellent book, "Everyone Loves A Good Drought", which is the anti-thesis of the pro-liberalization enthusiasts, and serves as a balanced counterpoint. Expectedly, food shortages and famines were virtually unknown in India, prior to the Company's rule. "... Cornelius Wallard calculated that in the 120 years of British rule there had been 34 famines in India, compared with only 17 recorded famines in the entire previous two millennia." [page 90]. Do the math and you can see that before the advent of British rule, India saw roughly a famine every 115 years, while after it was a famine every three and a half years! Even accounting for famines that may not have been recorded in the previous two thousand years, the difference is still staggering. "In 1772, Warren Hastings estimated that perhaps 10 million Bengalis had starved to death, equating to perhaps a third of the population." [page 92]. Mortality rates in some districts in Bengal, like Malda, reached 50%. However, it's not as if life for the Company employees was a bed of roses. "... for the Company a round trip from London to India and back could take up to two years. ... Over half its employees posted to Asia died while in service." [page 27] Yet such was the lure of India's riches that there was a steady stream of Englishmen making their way to India to make their fortunes. Landmark has the book available on its web site here. This is the publisher,Orient Longman's, book page. The book lists for Rs 330, and you can pick this book from most boostores in India. Some may also offer a 10-20% discount.